As participants select a small subset of records from the larger data set they are exploring in the installation‚ their representation transforms from luminous colored particles (one per GOS record) to a series of geometric shapes of different size‚ color and number of vertices. 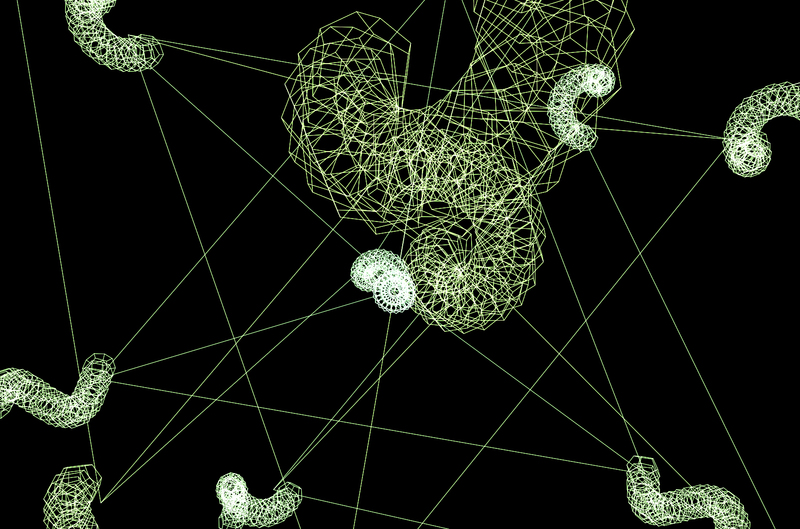 These shapes are n-dimensional glyphs generated by a custom meta shape grammar algorithm. We aim to generate glyphs that reflect differences in the underlying data or metadata so that differing data can potentially be visually sorted in an exploratory fashion‚ by an observer who is not familiar with the details of the mapping from data to glyph attributes. This requires an approach that generates as wide a range of distinctive patterns as possible. 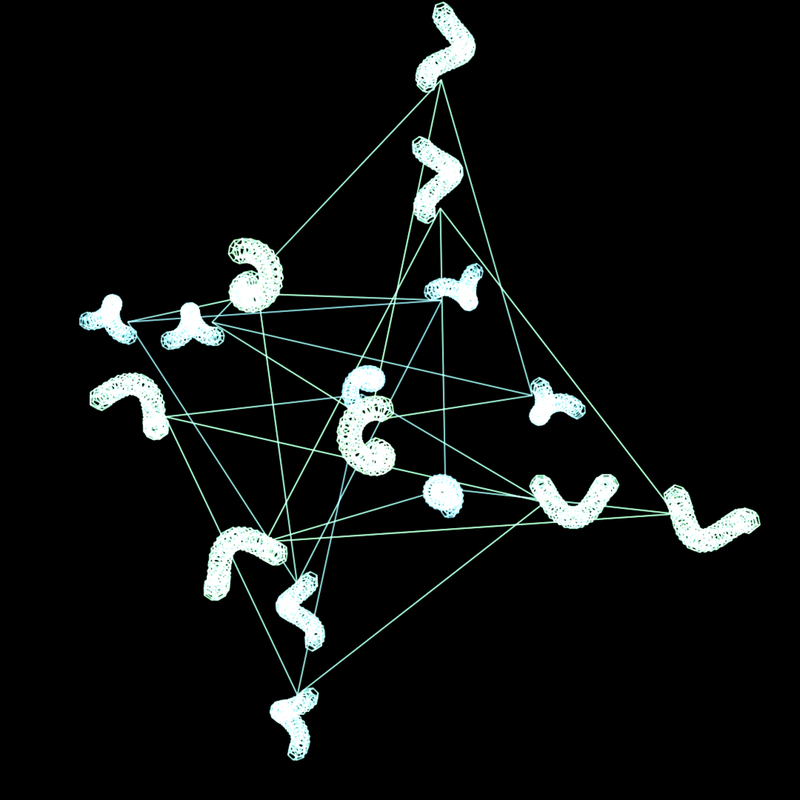 We select shape grammars for glyph generation because they generate a relatively large range of distinctive patterns relative to the coding complexity. 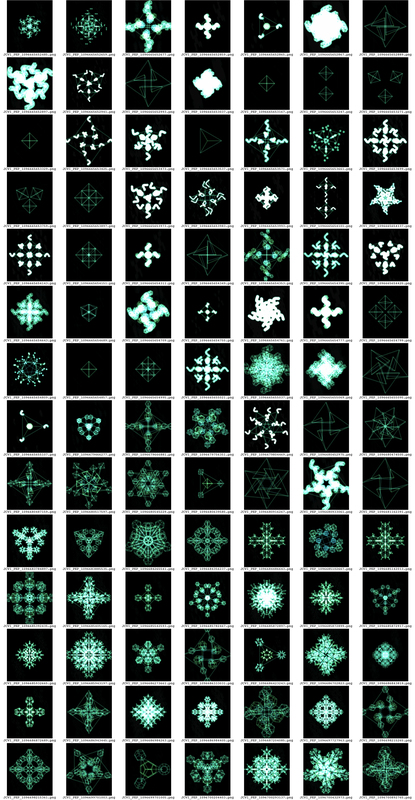 While shape grammars were one of the earlier approaches to computer pattern synthesis‚ they have remained relatively underexplored compared with popular approaches such as fractals and L-systems. Through preliminary work‚ we observed that picking rules without constraints generates chaotic shapes that are not memorable. Thus‚ it is desirable to have some structure in the rule selection process‚ yet still allow it to reflect the data. We used an approach in which the rule generation and interpretation is mapped to higher-order functions‚ a feature of functional languages such as Lisp and ML. An example of a meta-rule is a procedure that recursively builds and places other rules at the vertices of a polyhedron guided by some data attribute mapped to this rule. Data values driving glyph generation for each GOS record include a broad range of attributes such as amino acid sequence characteristics‚ geospatial information‚ and other metadata pertaining to each record and the overall data collection. See our publication about the shape grammar objects for more details.